Evening Prayer Group - This group meets at 5pm at St Andrew's Church Heckington Monday to Friday to say the Evening Office from Common Worship Daily Prayer, read the Scriptures for the day, and pray for the needs of the world, the persecuted church worldwide, and our local churches and village communities. Visitors are welcome. Heckington Fellowship Group meet at 31 Howell Road, Heckington on Wednesday mornings 10am till 12 noon. Contact Jane Ward 01529 460764. Forget me not Teas - This group meets at St Andrew's Heckington in the summer time months and at Heckington Methodist in the winter months. On the first and third Monday of each month between 2pm till 4pm it serves afternoon teas to those on their own, newly bereaved or who just enjoy a bit of company. They might have a game of cards or dominoes or just catch up with the latest. We currently have about 30 people enjoying teas served by Jan & Audrey and their team of helpers. Stitching Together - we are a friendly, creative, non-denominational and welcoming group, male and female of all abilities, who love to inspire and teach each other. We meet on Tuesday mornings at the Wesleyan Chapel on Eastgate, Heckington from 10.30am till 12 noon. 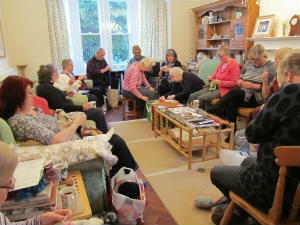 Come and knit & natter with some crafty folk! For more information contact Sheila 469564. The origins of Stitching Together was at the Rectory in 2012. St Andrews Singers based at Heckington St Andrew's meets on Thursday evening at Heckington St Andrews and sings twice a month at Sunday services at Heckington on the 1st & 3rd Sundays each month. The choir is restarting after Easter so if anyone is interested in joining please contact Rev Chris 460904. Tower Bells - We have three churches in our group with sets of tower bells (Great Hale 4, Heckington 8, Helpringham 5) and our friendly band of bell ringers meet to practise on most Tuesday nights at St Andrew's Heckington from 7.30pm till 9pm. Ringers and non ringers are very welcome.